ABSTRACT: The article discusses the applicability of Joseph Riepel’s Anfangsgründe zur musicalischen Setzkunst (1752–1765) to today’s music theory classroom. Riepel’s treatise, a lively dialogue between a teacher (Præceptor) and a student (Discantista) transcends historical boundaries, allowing students to gain hands-on experience with concepts that otherwise remain abstract. In the spirit of Riepel’s treatise, I do not merely discuss how Riepel’s Præceptor teaches the student to write minuets, but I describe how I use these instructions in the music theory classroom while providing a sample of my teaching materials. In the following essay, I discuss the beginning of Joseph Riepel’s Anfangsgründe zur musicalischen Setzkunst (Fundamentals of Musical Composition) and its application to today’s music theory classroom. (2) Riepel’s Anfangsgründe seems especially well suited for use in a theory class, because both the structure and the content of the treatise suggest a hands-on approach to musical composition. The different chapters of the Anfangsgründe resemble actual lessons in composition, unfolding as lively discussions between a teacher, the Præceptor, and his student, the Discantista. Because the beginning of the Anfangsgründe focuses on very basic musical issues, it does not require an extensive theoretical introduction. In each lesson a student and a teacher discuss the basic musical features of mid-eighteenth century style. I have been using Riepel’s instructions on how to compose minuets as a way of providing second semester theory students with a workshop that highlights the practical nature of concepts which might otherwise remain abstract. In order to grasp such concepts as tonicization and modulation, students recognize, analyze, and write mid-eighteenth-century minuets, in which these concepts are important constituents of the form. Riepel’s Præceptor begins the first lesson by asking his new student to write a sample composition so that he may find out if the Discantista has “sufficient knowledge of the proper structure of melody (ordentlichen Eintheilung des Gesanges). For whoever wants to build houses must have the materials to do so.”(5) The Discantista confidently presents the minuet reproduced in Example 1, which occurs in the text with numbers underneath each measure to facilitate the Præceptor’s comments and corrections. A composition, and especially a minuet, should always consist of an even number of measures (the second part of the student’s minuet is thirteen measures long). Each part should consist of no more than eight measures (again, the second part of the student’s minuet consists of thirteen measures). The beginning or theme should be set off by clearly recognizable Zweyer and Vierer, that is, two- and four-measure units (measures 2 and 3 in the student’s minuet each begin with a half-note, making it difficult to hear measure 3 as the beginning of a second two-measure unit.). The second part of the minuet should employ material that already has been presented in the first part (the second part of the student’s minuet has hardly any resemblance to the first). A minuet should, if possible, rise in the first part and fall in the second (the student’s minuet does the opposite). Measures 4 and 5 should be written with a recognizable difference. This would enable the listener to perceive measure four as the end of the first four-measure unit and measure five as the beginning of a second (however, measure 5 in the student’s minuet consists only of one dotted half-note and measures 5 to 8 show no resemblance to measures 1 through 4. Thus, not only does measure 5 start with a closing gesture but it also is difficult to perceive measures 5 to 8 as a second four-measure unit). The Præceptor’s first three objections seem repetitive, since the second one will automatically yield the first: if every part contains eight measures then the whole minuet can only consist of an even number of measures. Riepel, however, not only makes a point about the overall length of a composition (2) and then deals with aspects of rhythmic and metric coherence in a composition (1 and 3), but also begins his criticism by noting the large-scale issues first, similar to the way that he first presents a complete minuet which he then dissects. (9) Objection four addresses the note values within a measure, while five through seven again concern larger issues, i.e. (5) overall coherence, (6) registral shape, and (7) contrast between measures 4 and 5. The Discantista, truly horrified by the great number of problems identified by his teacher, immediately begs the Præceptor to teach him the essential concepts so that he can make the necessary changes at once. A Dreyer (Example 2b), the Præceptor explains, is similar to the Zweyer except that it is a measure longer. Disc. I understand this very well; because one can see and hear this. But which ones are better in a minuet, Zweyer or Dreyer? Præc. Zweyer. Because Dreyer are not used at all in it. However, I will tell you still today, where and how they can be used successfully. Disc. Thus one can make a Dreyer from a Zweyer, or vice versa, by cutting away a measure or adding one to it. We learn that while a Dreyer does not have a place in the minuet, it can be easily changed to a Zweyer. Indeed, Riepel’s Zweyer, Dreyer, and Vierer are not “organically” conceived units, but combinations of different numbers of measures. (15) Thus, the Præceptor’s Vierer (Example 2c), a four-measure unit, essentially comprises a Zweyer with two added measures. This, of course, raises the question of whether there is a difference between a Vierer and two Zweyer: After the Præceptor presents a Vierer which he deems fitting for a minuet, the Discantista remarks that the first Vierer (Example 2c, measures 1–4) does not seem very different from two Zweyer. “If [this Vierer] is not followed by another Vierer, I would accept your opinion if need be,” argues the Præceptor. “However, the [two] Zweyer would be clearer in the following manner than yours, for example [Example 2e]:”(16) He points out that this example (Example 2e) demonstrates a clearer division, “because the other Zweyer comes to rest a tone higher. Your Zweyer [Example 2d], however, remain both in the tone F.”(17) Indeed, the difference between Examples 2d and 2e lies in their tonal orientation. Stressing the importance of context, the Præceptor remarks that if no other Vierer follows, the first Vierer of Example 2c could be interpreted as two Zweyer. Not only can one change a Zweyer into a Dreyer or Vierer by adding measures, but the musical context also can change the interpretation of any of these groupings. Following the discussion of Zweyer, Dreyer, and Vierer, which dealt with the grouping of measures, the Præceptor’s attention shifts to the rhythmic content of a measure. The figure below (Figure 1) schematizes the rhythmic motion and contour within a measure. Riepel distinguishes between “running” (laufende), “rising” (erhebende), “dotted” (punctirte), and “immobile” (unbewegliche) notes. Among the running notes, there are those that move by step and those that move by leap. Riepel specifically discusses the difference between running notes that move upward and those that move downward, arguing that the upward moving ones are easier to perform. Among the rising notes (quarter notes), he distinguishes between “perfectly” and “imperfectly” rising notes. The names of a measure’s durational components, except for the “dotted notes,” are not technical (i.e., eighth-note, quarter-note, etc.) but descriptive and grounded in everyday experience. By using perception-based terms, Riepel enables students to immediately understand the issues discussed and also to remember the concepts more easily. In addition, by refraining to use mere technical labels, Riepel emphasizes their function within the measure, not how they are constructed. The Præceptor first introduces the “running notes that move by step” (stuffenweise laufende Noten) and the “running notes that move by leap” (sprungweise laufende Noten), which exemplify the difference between scales and arpeggios respectively. These “running notes,” the Præceptor explains, “[?] are the best notes in an Allegro assai, or Tempo presto and prestissimo of a symphony, a concerto, or solo and so forth, [? ].”(18) While these eighth-note runs can be successfully employed in larger compositions, the minuet has different demands. “For a minuet, however,” the Præceptor clarifies, “one needs always perfectly rising notes, that is quarter notes, for example:”(19) (see Figure 3a). These quarter notes, the Præceptor demonstrates, can be varied in the following ways: (see Figure 3b). While he encourages his student to create numerous variations, the Præceptor also teaches his student to choose the most desirable ones based on general notions of what “works” within a measure and the measure’s function, which is derived from its position within the minuet. (20) For example, Riepel’s Præceptor prefers eighth-note motion on the second and third beats and dislikes the combination of four eighth notes followed by a quarter note, as in measures 6 and 7 of the student’s sample composition (Example 1). (21) Although he rejects this rhythmic construction in general, the Præceptor does not object if it appears in a single measure. In addition, he considers the eighth-note motion (“running notes that move by step”) in the last four measures of the student’s minuet acceptable, “[b]ecause the minuet aims to reach its cadence and place of rest, almost as if someone hungry [runs] from his work for example to dinner, or ? You should not laugh,” scolds the teacher and defends his use of metaphors, arguing that they are necessary “because a beginner must imagine these and a thousand other comparisons if he does not want to fill his composition with empty, simple and lifeless notes [Riepel’s emphasis].”(22) In all these explanations, the Præceptor impresses on his student the importance of context, which changes the function of a rhythmic figure. Finally, after the Præceptor has discussed eighth, quarter, and half-notes, the Discantista asks if he may also use dotted notes, giving the music shown in Example 5a as an instance. The Præceptor objects, finding them unsuitable for a minuet. He dislikes the student’s dotted quarter-eighth-quarter combination, claiming that only a “limping dance master” (hinckenden Tanzmeister) might like them. However, if the Discantista must use dotted notes, then the following combination (Example 5b) is much more preferable. Riepel’s repertoire of rhythmic motion within a measure covers most usable combinations. However, the Præceptor does not simply list these rhythmic variants, but gives reasons why some are preferable to others. Some of the reasons are based on general considerations of the specific genre in question (a symphony can accommodate more elaborate rhythmic figures than a short minuet), others are functional (the beginning, middle, and end of a composition require different notes), or are based on aesthetic judgment and personal preference (the Præceptor sometimes freely admits to liking a particular combination). Thus these reasons allow us insight into the cultural norms (the mid-eighteenth-century expectation of what constitutes a minuet) and into Riepel’s personal choices and judgments. Often, of course, a particular choice is guided by several criteria. In this way, Riepel does not merely identify and discuss an inventory of rhythmic content and contour for a measure, but teaches criteria for choosing one above the other. After discussing the parts (the construction of Zweyer, Dreyer, and Vierer) and providing a detailed investigation of the rhythmic motion within a measure, the Præceptor shifts his attention to the whole, namely the overall shape of the minuet. For this, the teacher focuses on his last three objections to the student’s sample minuet: (5) motivic/thematic relationship between the different parts of a minuet, (6) melodic contour, and (7) clear separation of measures 4 and 5. In this section of the lesson, teacher and student deal with complex musical relationships. Similar to other beginning students, the Discantista often makes mistakes in another area while addressing issues of larger structures. As his fifth objection, the Præceptor argues that a minuet’s second part should be related to the first. The two terms that he uses to describe the relationship between the two parts of a minuet are: “similarity” (Aehnlichkeit) and “coherence” (Zusammenhang). In the revision of his sample minuet (Example 6), the Discantista marks the related parts “ .” “Notice,” he tells his teacher, “in the first part the notes go down, in the second, up. Thus, I believe that one can hear enough similarity and coherence.”(25) The Præceptor, however, is not satisfied with this and tells his student that many consider inverted notes ornamental. He argues that such inversions are often used in other compositions, but they are hardly recognizable in this context. Immediately, the student writes a number of variants that contain more direct relationships between the different parts of the minuet. The minuet seems an ideal composition for the theory classroom, because it is short and easy to comprehend and it requires only a limited harmonic knowledge. I have used Riepel’s compositional instructions many times at the end of a first-year music theory course to provide students with a hands-on experience of basic compositional strategies. (31) Since students are usually unprepared for dealing with composition in a specific style, their eighteenth-century “Capellmeister” training requires several stages: First students get to know the basic minuet structure by analyzing a number of minuets thereby recognizing their common features; second, the analyzed minuets provide a starting point for limited compositional assignments (i.e., composing a new melody above a given bass, harmonizing the melody of an existing minuet, composing a minuet based on a model, etc. ); and third, after students have gained some compositional experience within a clearly defined frame, they write their own minuets. In the first chapter of the Anfangsgründe, “De Rhythmopoeïa, or On Metric Order” (Tactordnung), which focuses on the rhythmic and metric structure of compositions, Riepel’s Præceptor teaches his student the fundamentals of composition, that is, how to use note values in a measure, how to group measures into larger units, and how to combine them into a minuet. In the second chapter, “Basic Rules Concerning the Order of Pitches” (Tonordnung), which considers minuets, concertos, and symphonies from the standpoint of their the tonal organization, Riepel discusses specific ways for continuing the second part of a minuet and how to extend a sixteen-measure long minuet to 32 measures and more by way of repetition, insertion of new or contrasting material, expansion (i.e., lengthening a section), and the doubling of a cadence, that is, the repeat of a cadential gesture. (32) Figure 3 schematizes the basic minuet structure, which can be found throughout the first two chapters of Riepel’s Anfangsgründe. Most minuets close their first section in the tonic, followed by turn to the dominant. The second section, and with it the first part, usually ends either with a half cadence on the dominant, like Examples 1 or 6 or, after a modulation to the dominant key, with an authentic cadence in the dominant, like Examples 7a, 7b, and 8. The second part opens either with Monte, Fonte, or Ponte and ends with a cadence in the tonic key. Monte, Fonte, or Ponte are melodic/harmonic continuation patterns, which Riepel discusses, in the second chapter of the Anfangsgründe. Monte, which means going up the mountain, consists of an ascending sequence (C–F followed by D–G in C major), harmonically V of IV going to IV followed by a V of V going to V movement. Fonte (going down a well), consists of a descending sequence (A–d followed by G–C, again in C major), harmonically V of ii going to ii followed by a V to I movement. Ponte (crossing a bridge) consists of a prolongation of the dominant that closes on the tonic. These continuation patterns usually appear after the double bar line in a minuet thus opening the second part. (33) The beginning of the second part of Examples 1, 6, and 8, and Examples 2a through 2e contain a Monte, while Examples 7a, 7b begin their second part with a Fonte. Because W. A. Mozart’s Minuets K. 1–7 stylistically match the minuets in Riepel’s Anfangsgründe, I have found them to be the best possible example for the class room. (34) Figure 4 provides an overview of some of their features. Except for K.2, which ends its first part with a half cadence (HC), all of Mozart’s Minuets K. 1–7 modulate to the key of the dominant and end their first part with a cadence in the dominant key (V-Cad.). In addition, all of them employ a continuation pattern at the beginning of the second part; two minuets begin with Monte (K. 4 and 5), four with Fonte (K. 1e, 1f, 2, and 3), and one with Ponte (K. 7), and end with a final cadence in the tonic key (I-Cad.). While both parts of K. 1e and 1f c are exactly eight measures long, the remaining minuets contain sections with 10, 12, 14, or 16 measures. 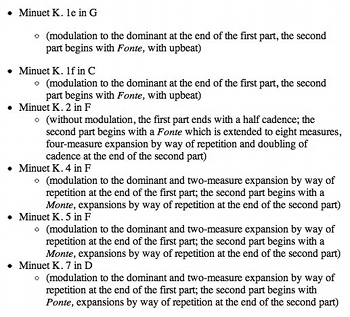 Figure 5 summarizes my interpretation of the metric and harmonic structure of Mozart’s Minuets K. 1–7. As Figure 5 demonstrates, all minuets are constructed out of even numbered metric groupings. Four measure structures, Vierer, are usually the result of the combination of two two-measure units, two Zweyer. The two Zweyer can either be joined (+), repeated (R), or transposed (T) in order to create the Vierer, the four-measure groupings. I find such a distinction helpful because it emphasizes the structural difference between the functional sections of a minuet. For example, a beginning Vierer will usually not be the result of a transposed Zweyer, because the function of the opening Vierer is to acknowledge and strengthen the tonic. On the other hand the second part usually opens with a transposed Zweyer, because the transposition is part of the contrast provided by the continuation patterns. Figure 5 also lists instances of inserted measure (I) and doubling of the cadence (Dblg.). The former is easily distinguished in that the inserted material usually stands out and is not related to the surrounding music, while the later presents a special case of repetition, which simply restates the cadential measures. This often happens in combination with a deceptive or weak cadence and requires a restatement of the cadence. In addition to the metric structure Figure 5 provides also a basic harmonic overview of the different minuets. The Vierer in a minuet usually end either on the tonic (I) or Dominant (V); yet I also show the Zweyer of Monte and Fonte, which end on IV and ii respectively. If the ending is not a formal cadence with a stepwise approach of the final note in the melody and leap from the fifth to the first scale degree in the bass, it is simply identified with the scale degree (I or V). (35) Discounting the extensions by way of repeats, sequences, transpositions, and insertion, Mozart’s minuets clearly adhere to the minuet structure taught by Riepel. The two-page “K. 1–7 Mozart Minuet (Basic 8+8 Structure)” allows for easy comparison of the harmonic and thematic details in the six minuets. All minuets are reduced to the minimum requirement of sixteen (8+8) measures, which allow just for the four required sections of the minuet. The following handout “Minuet Extensions,” which identifies all the extension measures that have been left out, is useful for comparing the reduced versions with the real minuets. Usually, I demonstrate the effect of leaving out a repeated section during the analysis of the individual minuets. Thus the handouts merely summarize something that students have already heard. However, I always emphasize that the reduced minuets do not replace the complete minuets but that they prove a conceptual stance. Thus whenever I leave out repeated measures to demonstrate a structural aspect, I later bring them back again and discuss with students why the repeat works. The “K. 1–7 Cadential Patterns” handout demonstrates the melodic variety within the basis IV–V – –I or ii6–V – –I structure. 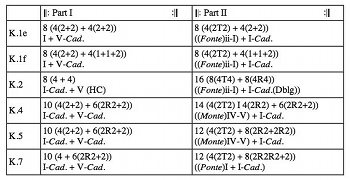 All of them are perfect authentic cadences, except for the half cadence in K. 2 (boxed example). The handout emphasizes not only the melodic variety of the cadential patterns but also a number of other features. First, it makes clear that a cadence requires two measures: the first contains the pre-dominant and the cadential 6/4, the second measure the final cadential harmony. Second, it demonstrates the importance of the hexachord above the final note as the melody of half of the cadences leaps up to the sixth scale degree before descending stepwise or with skips to the final tonic (for example, K. 1e La–Sol–Fa–Mi–Re–Do and La–Fa–Re–Do–Ti–Do); many of the remaining cadences leap at least to the fourth scale degree (for example, K. 5 Fa–Mi–Re–Ti–Do with thirds and K. 7 Re–Fa–Mi–Re–Do–Ti–Do). In addition, the handout serves a practical purpose as it allows students to “cut and paste” cadences into their own assignments. The “K. 1–7 Continuation Patterns (Monte, Fonte, and Ponte)” provides an overview of the some of the melodic possibilities for the beginning of the minuet’s second part after the double bar line. Again, I encourage students to consider the handout a collection of continuation patterns from which they can draw for their own compositions. Students often only need to transpose, and slightly alter them before they can paste these patterns into their own compositions. In summary, I have found that this step-by-step approach, consisting of analysis and guided composition, provides a meaningful and engaging introduction to working with stylistic copies. The limited composition assignments especially guide student’s efforts without overwhelming them with the task of writing a whole composition. While I have experimented with many different approaches over the years, my central concern has remained to provide students with a historically contextualized hands-on experience of compositional procedures that are shared by most common practice compositions. Allanbrook, Wye J (trans.). 1998. “Joseph Riepel: From: Fundamentals of Musical Composition.” Source Readings in Music History, Revised Edition, Edited by Leo Treitler, New York and London: W. W. Norton & Company, 749–61. Balthazar, Scott L. 1983. “Intellectual History and Concepts of the Concerto: Some Parallels from 1750 to 1850,” Journal of the American Musicological Society 36, no. 1, 39–72. Brumbeloe, Joseph Leonard. 1991. Formal Grouping in the Theory and Musical Practice of the Eighteenth Century, Ph.D. diss., Indiana University. Budday, Wolfgang. 1987. “Über ‘Form’ und ‘Inhalt’ in Menuetten Mozarts,” Archiv für Musikwissenschaft 44, no. 1, 58–89. Budday, Wolfgang. 1983. Grundlagen musikalischer Formen der Wiener Klassik: An Hand der zeitgen?ssischen Theorie von Joseph Riepel und Heinrich Christoph Koch dargestellt an Menuetten und Sonatensätzen (1750–1790), Kassel: Bärenreiter. —————. 1983. Grundlagen musikalischer Formen der Wiener Klassik: An Hand der zeitgen?ssischen Theorie von Joseph Riepel und Heinrich Christoph Koch dargestellt an Menuetten und Sonatensätzen (1750–1790), Kassel: Bärenreiter. Clendinning, Jane Piper and Elizabeth West Marvin. 2005. The Musician’s Guide to Theory and Analysis. New York: W.W. Norton & Company. Cook, Nicholas. 1996. Analysis through Composition: Principles of the Classical Style. New York and Oxford: Oxford University Press. Eckert, Stefan. 2000. Ars Combinatoria, Dialogue Structure, and Musical Practice in Joseph Riepel’s Anfangsgründezur musicalischen Setzkunst, Ph.D. diss., State University of New York at Stony Brook. Feil, Arnold. 1955. Satztechnische Fragen in den Kompositionslehren von F. E. Niedt, J. Riepel und H. Chr. Koch, Ph.D. diss., University of Heidelberg. Gauldin, Robert. 1995. A Practical Approach to Eighteenth-Century Counterpoint. 2nd edition. Prospect Heights, Illinois: Waveland Press. Gjerdingen, Robert O. Forthcoming. The Craft of Eighteenth-Century Court Music: A Treatise on Various Schemata Characteristic of the Galant Style. Aldershot, U.K.: Ashgate Press. Ratner, Leonard. 1980. Classic Music — Expression, Form, and Style, New York: Schirmer Books. Reed, Nola Jane. 1983. The Theories of Joseph Riepel as expressed in his Anfangsgründezur Musicalischen Setzkunst (1752–1768), Ph.D. diss., University of Rochester, Eastman School of Music. Riepel, Joseph. 1755. Grundregeln zur Tonordnung insgemein, Abermal durchgehends mit musicalischen Exempeln abgefaßt und Gespräch-weise vorgetragen, Frankfurt, Leipzig, und aller Orten Teutschlands, wo das erste Capitel von der Tactordnung zu haben ist. Riepel, Joseph. 1752. Anfangsgründezur musikalischen Setzkunst: Nicht zwar nach alt-mathematischer Einbildungsart der Zirkel-Harmonisten, Sondern durchgehends mit sichtbaren Exempeln abgefasset, De Rhythmopoeia, oder von der Tactordnung, Regensburg. —————. 1752. Anfangsgründezur musikalischen Setzkunst: Nicht zwar nach alt-mathematischer Einbildungsart der Zirkel-Harmonisten, Sondern durchgehends mit sichtbaren Exempeln abgefasset, De Rhythmopoeia, oder von der Tactordnung, Regensburg. * This is an expanded version of a paper presented at the 27th annual meeting of the Society for Music Theory in Seattle 2004. I would like to thank Robert Gjerdingen and my anonymous reviewers for their comments and suggestions. This is an expanded version of a paper presented at the 27th annual meeting of the Society for Music Theory in Seattle 2004. I would like to thank Robert Gjerdingen and my anonymous reviewers for their comments and suggestions. 1. Glenn Gould wrote So You Want to Write a Fugue? for The Anatomy of the Fugue, a CBC-TV Festival program, broadcast on March 4, 1963. Glenn Gould Archive (Accessed 15 June 2005), http://www.collectionscanada.ca/glenngould/m23-305-e.html. 3. While Cook (1996) also works on the basis of historical models and sources, I find his treatment of individual topics too cursory and his overall approach too eclectic for use in the classroom. Yet Cook’s text offers a good starting point for exploring ideas about stylistic copies. 4. Fortunately, the revised Strunk contains a translation of the opening section. See Allanbrook 1998. 5. “[Præc. ]‘eine hinlänglich Erkenntniß?von der ordentlichen Eintheilung des Gesanges. Denn wer Häuser baut, muss die Materialien dazu haben” (Riepel 1752, 1.). 6. “Disc. Nach meinem Erachten ist auf der Welt nichts leichter zu componiren als ein Menuet; ja ich getrauete mir flugs ein ganzes Dutzend nacheinander herzuschreiben” (Riepel 1752, 1.). 7. “Præc. Himmel! du kennest ja noch nicht einmal die Noten voneinander. Von diesem Minuet, wenn ich ihn so nennen darf, [?] mag er gefallen wem er will; ich meines Ortes gebe dir keine gute Pfeife Knaster dafür” (Riepel 1752, 2.). 8. See Riepel 1752, 2. 9. Nola Reed (1983) and Joseph Brumbeloe (1991) also emphasize that the first point concerns the overall length of a composition and points two and three are concerned with inner coherence (See Reed 1983, 34-35 and Brumbeloe 1991, 78–79.). In addition, Scott Balthazar (1983) points out that Riepel’s tendency to begin a topic by presenting it first in its entirety and then dealing with its details, bears resemblance to Gottfried Wilhelm Leibniz’s conception of the universe (See Balthazar 1983, 39–72.). 10. Since Riepel does not use the terms “phrase” or “period” within the Anfangsgründe, I will use the more neutral terms “unit” and “section” to refer to groups of measures. The reason for this is that Riepel’s conception of musical punctuation differs substantially from nineteenth-century theories of phrase structure. This issue is addressed in Eckert (2000). 11. Later in the Anfangsgründe, Riepel discusses groupings of up to nine measures (Neuner). 12. “[Præc.] Eine Zweyer** [Footnote: **Binarius] bestehet in 2. Täcten, welche andern darauf folgenden 2. Täcten der Bewegung nach, meistentheils ähnlich sind, zum Ex.” (Riepel 1752, 2.). 13. See Riepel 1752, 2. Riepel identifies this ascending sequence as a feature of a Monte (going up the mountain) in the second chapter of the Anfangsgründe. I will discuss this and other continuation patterns, which open the second part of a minuet, later. 14. “Disc. Das verstehe ich nun sehr wohl; denn man kann es sehen und h?ren. Allein welche sind besser zu einem Men., die Zweyer oder Dreyer? Præc. Die Zweyer. Denn die Dreyer sind gar nichts nütze dazu. Ich will dir aber heut noch sagen, wann und wo diese gut angebracht k?nnen werden. Disc. Also kan man ja aus einem Zweyer einen Dreyer, oder aus diesem jenen machen, wenn man z. Example bald einen Tact abschneidet, und bald einen hinzu thut. Præc. Auf alle Weise” (Riepel 1752, 3.). 15. In his 1955 dissertation discussing eighteenth-century compositional theory, Arnold Feil argues that although Riepel presents groups of measures, “the first building block is the measure and not the measure group, even if it does not appear individually.” In order to support his argument, Feil reproduces Riepel’s Zweyer, Dreyer, and Vierer with lower-case letters underneath each measure. For example, he marks the four measures of Riepel’s “first Zweyer” and “other Zweyer” (Example 2a) a, b, c, and d respectively. While Feil’s view is not without merit—individual measures are indeed the basic building blocks—his interpretation ignores Riepel’s own identification of the second Zweyer as a repeat of the first. Thus the first Zweyer creates a grouping that needs to be considered as a whole. Hence, the measures in the example should not be labeled a, b, c, and d, but a, b, a’, and b.’ See Feil 1955, 38–39. 16. “[Præc.] Wenn nicht noch ein Vierer nachfolgete, so wollte ich deine Meinung zur Noth endlich noch gelten lassen. Jedennoch würden sich die Zweyer auf folgende Art deutlicher ausnehmen, als die Deinigen, z. Ex?” (Riepel 1752, 3.). 17. “[Præc.] Daher, weil hier der andere Zweyer um einen Ton h?her zu stehen kommt. Deine Zweyer hingegen halten sich beide in dem Tone F auf” (Riepel 1752, 3.). 18. “[Præc. ]?sie sind gut, und zwar in einem Allegro assai, oder Tempo presto, und prestissimo einer Sympfonie, eines Concerts, oder Solo, und so weiter, unter allen die besten Noten?” (Riepel 1752, 4.). 19. “[Præc.] Zu einem Menuet aber werden stets vollkommen erhebende, nämlich Viertelnoten erfordert, z. Ex.” (Riepel 1752, 4.). 20. Variation by means of ars combinatoria is an integral aspect of Riepel’s compositional approach. See Eckert (2000) for a discussion of the role of ars combinatoria in Riepel’s Anfangsgründe. 21. The Præceptor’s dislike for such a rhythmic construction is easily understood, since the eighth-notes clearly undermine the down-beat. The single quarter-note at the end gives rise to a rhythmic accent on beat three. 22. “[Præc.] Darum, weil der Men. gleichsam trachtet zu seiner Cadenz oder Ruhe zu gelangen, gleich wie ein Hungriger von seiner Arbeit etwan zum Abendessen, oder ? Du sollst nicht lachen, denn diese und tausend andere Gleichnissen muß sich, sonderlich ein Anfänger, vorstellen, sofern er seine Composition nicht mit leeren, einfältigen und papirenen Noten anfüllen will [Riepel’s emphasis]” (Riepel 1752, 5.). 23. “[Præc. ]?eine unbewegliche Note in der Mitte eines so kurzen oder tanzmäßigen Men. niemals, sondern nur am Ende des ersten und zweyten Theils gebraucht wird. Man kann aber eine solche unbewegliche oder todte Note lebendig machen auf folgende Art, z. Ex.” (Riepel 1752, 5.). 24. “[Præc.] Nun zwey solche Täcte sind in einem Men. nichts nütze?” (Riepel 1752, 5.). 25. “[Disc.] Merke wohl auf! Im ersten Theile gehen die Noten herab, in dem zweyten hinauf, und so glaube ich, daß genug Aehnlichkeit oder Zusammenhang geh?ret werde” (Riepel 1752, 6.). 26. “[Præc.] Warte ein wenig! Du bist gar zu hoch gestiegen, ich will sagen, der Men. ist auf solche Art zu jung, hintenmal der Gesang das Ernsthafte und Mannbare dadurch verlieret [Riepel’s emphasis]” (Riepel 1752, 7.). 27. “[Præc.] Das ist sehr gut. Jedoch braucht man eben nicht mit allen Zweyern zu steigen oder fallen; ja es binden sich die Cadenzen fast gar mehr an diese Regel: indem oft die Cadenz des zweyten Theils für sich ganz allein das fallen: gleich wie im ersten Theile eine einzige Note das Steigen ausdrücken kann, z.Ex.” (Riepel 1752, 8.). 28. “[Præc.] Er k?nnte dieses eben auch beobachten, wenn er wollte; allein er ist oft so ausschweifend, daß er gar keiner Regel folgen will. Zudem so kann der erste Theil einen zuh?renden Liebhaber auf einmal so sehr einnehmen, daß er sich nicht viel um den zweyten Theil bekümmert, weil dieser ohnehin nur als ein Beschluß des ersten Theils anzusehen ist” (Riepel 1752, 8.). 29. Monte (going up the mountain), is a melodic/harmonic pattern which appears usually after the double barline in a minuet. In its basic form it is constituted by an ascending sequence: C–F followed by D–G (in C major), which is usually harmonized with a V/IV going to IV followed by a V/V going to V movement. I will discuss this and other patterns, which Riepel presents, in the next part. 30. Wolfgang Budday’s (1983) dissertation, which surveys minuets written between 1750 and 1790, clearly demonstrates the close relationship between Riepel’s instructions and contemporaneous musical practice. 31. While the harmonic competence for dealing with the minuet is usually reached by the end of the first year, I have also used it for a review of diatonic harmony in upper level classes. 32. For a discussion of Riepel’s means of extension, see Eckert (2000) 172–183. 33. Robert Gjerdingen’s forthcoming book on galant schematas dedicates a chapter to each of the three continuation patterns and their varied appearance in the repertoire. For a discussion of Monte, Fonte, and Ponte in recent theory textbooks, see Gauldin (1995) and Clendinning and West Marvin (2005). 34. Wolfgang Budday (1987) argues that Leopold Mozart taught his son composition using the second chapter of Riepel’s Anfangsgründe (1755). Indeed it is quite remarkable how closely W. A. Mozart’s early minuets match Riepel’s instructions. 35. Riepel considers an ending that is not a formal cadence an Absatz. While I teach Monte, Fonte, and Ponte to my students, I usually avoid discussing the finer points of mid-eighteenth century musical punctuation to keep the number of new concepts to a minimum. 36. In order to enable students to compare the different minuets more easily and allow for using sections in their own composition, the following three handouts transpose the minuets into C major. 37. For a full discussion of the opening section of Riepel’s Anfangsgründeplease see Part I of this essay. Glenn Gould wrote So You Want to Write a Fugue? for The Anatomy of the Fugue, a CBC-TV Festival program, broadcast on March 4, 1963. Glenn Gould Archive (Accessed 15 June 2005), http://www.collectionscanada.ca/glenngould/m23-305-e.html. While Cook (1996) also works on the basis of historical models and sources, I find his treatment of individual topics too cursory and his overall approach too eclectic for use in the classroom. Yet Cook’s text offers a good starting point for exploring ideas about stylistic copies. Fortunately, the revised Strunk contains a translation of the opening section. See Allanbrook 1998. “[Præc. ]‘eine hinlänglich Erkenntniß?von der ordentlichen Eintheilung des Gesanges. Denn wer Häuser baut, muss die Materialien dazu haben” (Riepel 1752, 1.). “Disc. Nach meinem Erachten ist auf der Welt nichts leichter zu componiren als ein Menuet; ja ich getrauete mir flugs ein ganzes Dutzend nacheinander herzuschreiben” (Riepel 1752, 1.). “Præc. Himmel! du kennest ja noch nicht einmal die Noten voneinander. Von diesem Minuet, wenn ich ihn so nennen darf, [?] mag er gefallen wem er will; ich meines Ortes gebe dir keine gute Pfeife Knaster dafür” (Riepel 1752, 2.). Nola Reed (1983) and Joseph Brumbeloe (1991) also emphasize that the first point concerns the overall length of a composition and points two and three are concerned with inner coherence (See Reed 1983, 34-35 and Brumbeloe 1991, 78–79.). In addition, Scott Balthazar (1983) points out that Riepel’s tendency to begin a topic by presenting it first in its entirety and then dealing with its details, bears resemblance to Gottfried Wilhelm Leibniz’s conception of the universe (See Balthazar 1983, 39–72.). Since Riepel does not use the terms “phrase” or “period” within the Anfangsgründe, I will use the more neutral terms “unit” and “section” to refer to groups of measures. The reason for this is that Riepel’s conception of musical punctuation differs substantially from nineteenth-century theories of phrase structure. This issue is addressed in Eckert (2000). Later in the Anfangsgründe, Riepel discusses groupings of up to nine measures (Neuner). “[Præc.] Eine Zweyer** [Footnote: **Binarius] bestehet in 2. Täcten, welche andern darauf folgenden 2. Täcten der Bewegung nach, meistentheils ähnlich sind, zum Ex.” (Riepel 1752, 2.). See Riepel 1752, 2. Riepel identifies this ascending sequence as a feature of a Monte (going up the mountain) in the second chapter of the Anfangsgründe. I will discuss this and other continuation patterns, which open the second part of a minuet, later. “Disc. Das verstehe ich nun sehr wohl; denn man kann es sehen und h?ren. Allein welche sind besser zu einem Men., die Zweyer oder Dreyer? In his 1955 dissertation discussing eighteenth-century compositional theory, Arnold Feil argues that although Riepel presents groups of measures, “the first building block is the measure and not the measure group, even if it does not appear individually.” In order to support his argument, Feil reproduces Riepel’s Zweyer, Dreyer, and Vierer with lower-case letters underneath each measure. For example, he marks the four measures of Riepel’s “first Zweyer” and “other Zweyer” (Example 2a) a, b, c, and d respectively. While Feil’s view is not without merit—individual measures are indeed the basic building blocks—his interpretation ignores Riepel’s own identification of the second Zweyer as a repeat of the first. Thus the first Zweyer creates a grouping that needs to be considered as a whole. Hence, the measures in the example should not be labeled a, b, c, and d, but a, b, a’, and b.’ See Feil 1955, 38–39. “[Præc.] Wenn nicht noch ein Vierer nachfolgete, so wollte ich deine Meinung zur Noth endlich noch gelten lassen. Jedennoch würden sich die Zweyer auf folgende Art deutlicher ausnehmen, als die Deinigen, z. Ex?” (Riepel 1752, 3.). “[Præc.] Daher, weil hier der andere Zweyer um einen Ton h?her zu stehen kommt. Deine Zweyer hingegen halten sich beide in dem Tone F auf” (Riepel 1752, 3.). “[Præc. ]?sie sind gut, und zwar in einem Allegro assai, oder Tempo presto, und prestissimo einer Sympfonie, eines Concerts, oder Solo, und so weiter, unter allen die besten Noten?” (Riepel 1752, 4.). “[Præc.] Zu einem Menuet aber werden stets vollkommen erhebende, nämlich Viertelnoten erfordert, z. Ex.” (Riepel 1752, 4.). Variation by means of ars combinatoria is an integral aspect of Riepel’s compositional approach. See Eckert (2000) for a discussion of the role of ars combinatoria in Riepel’s Anfangsgründe. The Præceptor’s dislike for such a rhythmic construction is easily understood, since the eighth-notes clearly undermine the down-beat. The single quarter-note at the end gives rise to a rhythmic accent on beat three. “[Præc.] Darum, weil der Men. gleichsam trachtet zu seiner Cadenz oder Ruhe zu gelangen, gleich wie ein Hungriger von seiner Arbeit etwan zum Abendessen, oder ? Du sollst nicht lachen, denn diese und tausend andere Gleichnissen muß sich, sonderlich ein Anfänger, vorstellen, sofern er seine Composition nicht mit leeren, einfältigen und papirenen Noten anfüllen will [Riepel’s emphasis]” (Riepel 1752, 5.). “[Præc. ]?eine unbewegliche Note in der Mitte eines so kurzen oder tanzmäßigen Men. niemals, sondern nur am Ende des ersten und zweyten Theils gebraucht wird. Man kann aber eine solche unbewegliche oder todte Note lebendig machen auf folgende Art, z. Ex.” (Riepel 1752, 5.). “[Præc.] Nun zwey solche Täcte sind in einem Men. nichts nütze?” (Riepel 1752, 5.). “[Disc.] Merke wohl auf! Im ersten Theile gehen die Noten herab, in dem zweyten hinauf, und so glaube ich, daß genug Aehnlichkeit oder Zusammenhang geh?ret werde” (Riepel 1752, 6.). “[Præc.] Warte ein wenig! Du bist gar zu hoch gestiegen, ich will sagen, der Men. ist auf solche Art zu jung, hintenmal der Gesang das Ernsthafte und Mannbare dadurch verlieret [Riepel’s emphasis]” (Riepel 1752, 7.). “[Præc.] Das ist sehr gut. Jedoch braucht man eben nicht mit allen Zweyern zu steigen oder fallen; ja es binden sich die Cadenzen fast gar mehr an diese Regel: indem oft die Cadenz des zweyten Theils für sich ganz allein das fallen: gleich wie im ersten Theile eine einzige Note das Steigen ausdrücken kann, z.Ex.” (Riepel 1752, 8.). “[Præc.] Er k?nnte dieses eben auch beobachten, wenn er wollte; allein er ist oft so ausschweifend, daß er gar keiner Regel folgen will. Zudem so kann der erste Theil einen zuh?renden Liebhaber auf einmal so sehr einnehmen, daß er sich nicht viel um den zweyten Theil bekümmert, weil dieser ohnehin nur als ein Beschluß des ersten Theils anzusehen ist” (Riepel 1752, 8.). Monte (going up the mountain), is a melodic/harmonic pattern which appears usually after the double barline in a minuet. In its basic form it is constituted by an ascending sequence: C–F followed by D–G (in C major), which is usually harmonized with a V/IV going to IV followed by a V/V going to V movement. I will discuss this and other patterns, which Riepel presents, in the next part. Wolfgang Budday’s (1983) dissertation, which surveys minuets written between 1750 and 1790, clearly demonstrates the close relationship between Riepel’s instructions and contemporaneous musical practice. While the harmonic competence for dealing with the minuet is usually reached by the end of the first year, I have also used it for a review of diatonic harmony in upper level classes. For a discussion of Riepel’s means of extension, see Eckert (2000) 172–183. Robert Gjerdingen’s forthcoming book on galant schematas dedicates a chapter to each of the three continuation patterns and their varied appearance in the repertoire. For a discussion of Monte, Fonte, and Ponte in recent theory textbooks, see Gauldin (1995) and Clendinning and West Marvin (2005). Wolfgang Budday (1987) argues that Leopold Mozart taught his son composition using the second chapter of Riepel’s Anfangsgründe (1755). Indeed it is quite remarkable how closely W. A. Mozart’s early minuets match Riepel’s instructions. Riepel considers an ending that is not a formal cadence an Absatz. While I teach Monte, Fonte, and Ponte to my students, I usually avoid discussing the finer points of mid-eighteenth century musical punctuation to keep the number of new concepts to a minimum. In order to enable students to compare the different minuets more easily and allow for using sections in their own composition, the following three handouts transpose the minuets into C major. For a full discussion of the opening section of Riepel’s Anfangsgründeplease see Part I of this essay.